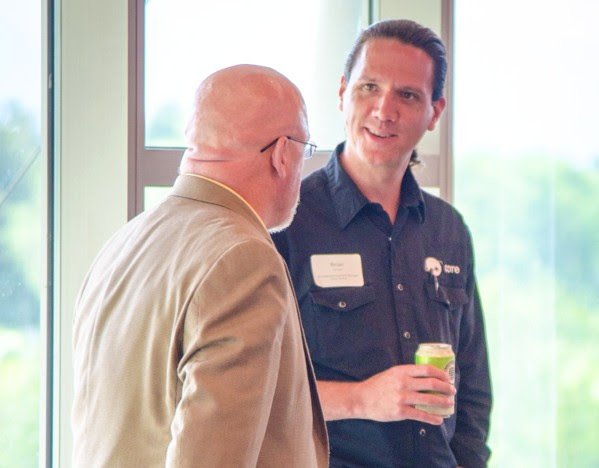 Blackfoot hosted tech leaders from across the state – Billings, Bozeman, Hamilton, Helena, Polson, and Rocky Boy – for the Montana High Tech Business Alliance member reception in Missoula on May 24, 2018. Blackfoot CEO Jason Williams, Marketing Communications Specialist Debbie Dantic, and their team provided gourmet appetizers and beverages, fabulous door prizes, and warm hospitality for the reception held on the third floor at Missoula College. 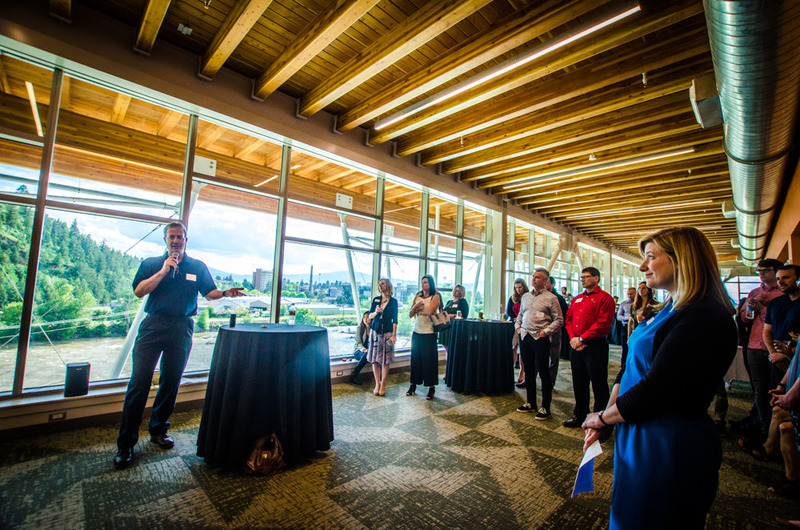 Members and guests had sweeping views of the Clark Fork River flooded to record heights. Blackfoot also hosted the CEO Roundtable in the Blackfoot Cafe on the River Level at the college. View the album on our website. Photos by Paige Pavalone, Pistol Creek Photography. Brian Johnson, right, Business Development Director for Bozeman-based Core Control, talks with Montana Manufacturing Extension Center Director Paddy Fleming. Core Control, a Building Systems Automation provider, is a new member of the Alliance as of late March 2018 and joined as a referral from Fleming and MMEC. Johnson also participated in the CEO Roundtable discussion on Planning for Growth and connected with like-minded firms from Missoula and Bozeman. He said it’s a challenge for Core Control to find workers who can navigate the interface of high-tech, plumbing, and HVAC, but the company is committed to finding and training the best talent. WGM Group Land Use Planner Nick Kaufman gave an update on his company’s growth from 55 to 75 employees in the last 6 months. WGM Group is a planning, engineering, survey, transportation design, hydrology, environmental and water rights firm with headquarters in Missoula. WGM opened an office in Kalispell last year and an office in Bozeman three months ago. The firm has also added employees in Helena, where it hopes to open an office soon. Kaufman presented his team’s philosophy to “learn from the past, plan for the future, and imagine” in re-envisioning land use in areas like the East Missoula corridor near WGM Group, MonTEC and the University of Montana. Sunburst Sensors CEO James Beck shared the story of how his small 10-person company in land-locked Montana won both purses of the $2 million Wendy Schmidt Ocean Health XPRIZE in 2015. Sunburst Sensors was launched in Missoula in 1999 by Michael DeGrandpre and David Irwin to manufacture CO2 and pH instruments for marine and fresh-water use. Scientists across the globe use the company’s sensors to collect data and measure the impact of increased acidity on coral and other ocean creatures. 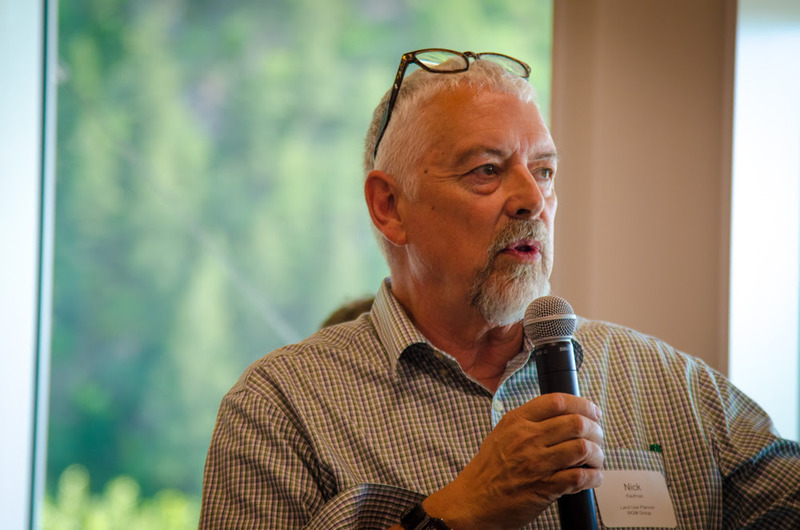 Born in Missoula, Beck joined Sunburst Sensors and fulfilled his dream of returning to Montana after reconnecting with DeGrandpre at their class reunion at Capital High School in Helena. 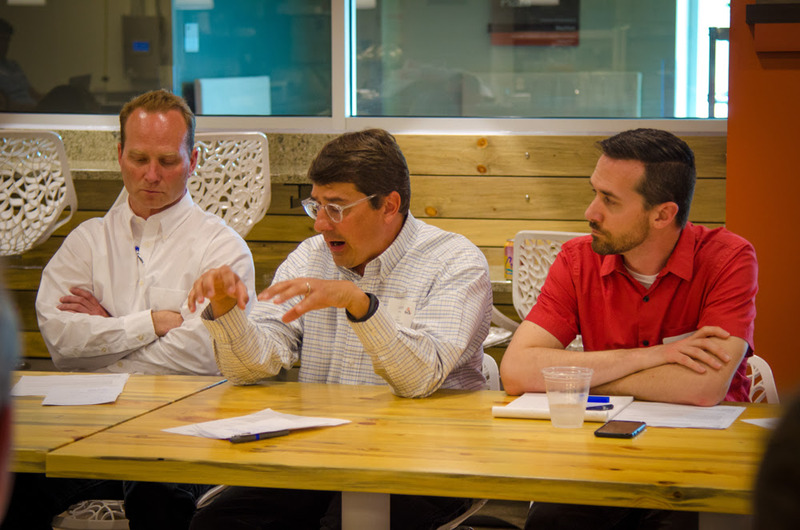 Left to right, Joe Easton, Director of Project Development for Jackson Contractor Group in Missoula, Jason Williams, CEO of Blackfoot in Missoula, and Jimmy Talarico, Project Designer/Business Development for CTA Architects/Engineers in Bozeman were featured speakers at the CEO Roundtable on “Planning for Growth.” The discussion focused on best practices for growing companies considering real estate needs, as well as issues affecting members across the state such as limited downtown parking and affordable housing. Watch for detailed coverage of the conversation in a future newsletter.